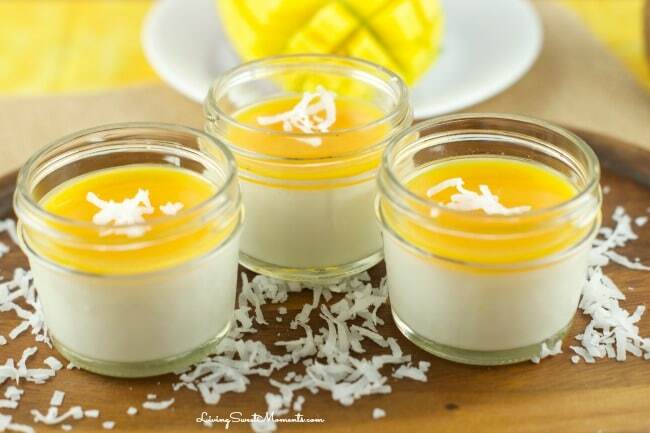 Coconut Panna Cotta With Mango Gelee – Delicious and creamy coconut Panna cotta topped with tropical mango gelee for a fun and easy summer dessert. love it! 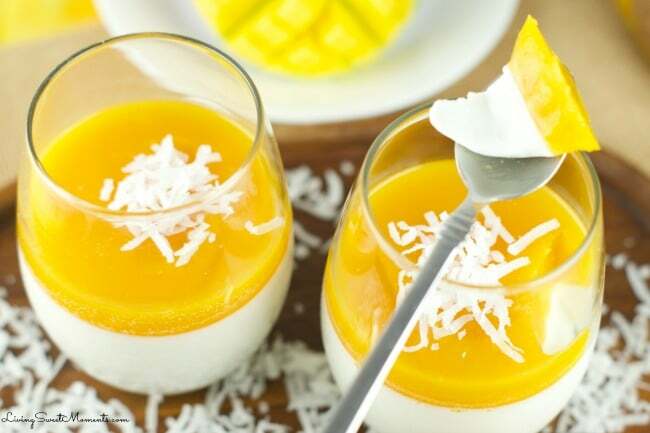 Delicious and creamy coconut Panna Cotta topped with tropical Mango Gelee for a fun and easy summer dessert that’s perfect for parties and get-togethers. 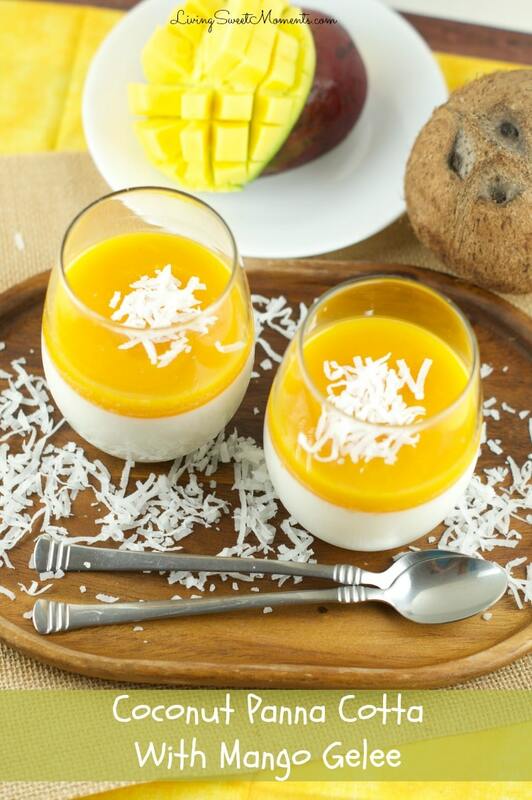 When you take a spoonful you will get creamy coconut with a tangy mango topping. All in all, it’s a flavor explosion in your mouth. If you’ve never tried Panna Cotta before, you’re going to love it. It’s like eating a creamy smooth jello. It has a solid consistency with a soft bite to it. A Gelee is basically a homemade jelly. So forget the fancy names, grab a spoon and let’s dig in. When you eat it, you will automatically transported to a tropical island. So refreshing and flavorful. Making it, it’s so easy. 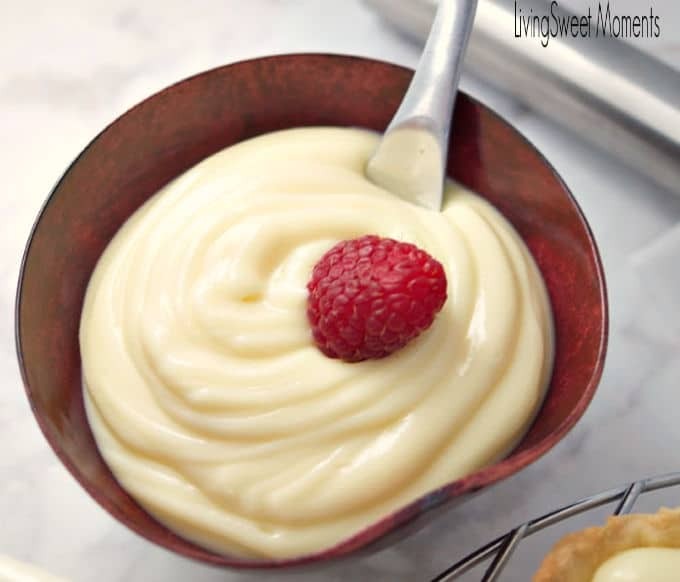 Once you learn how the process goes, you will be making panna cottas left and right. Something so simple can be very elegant. 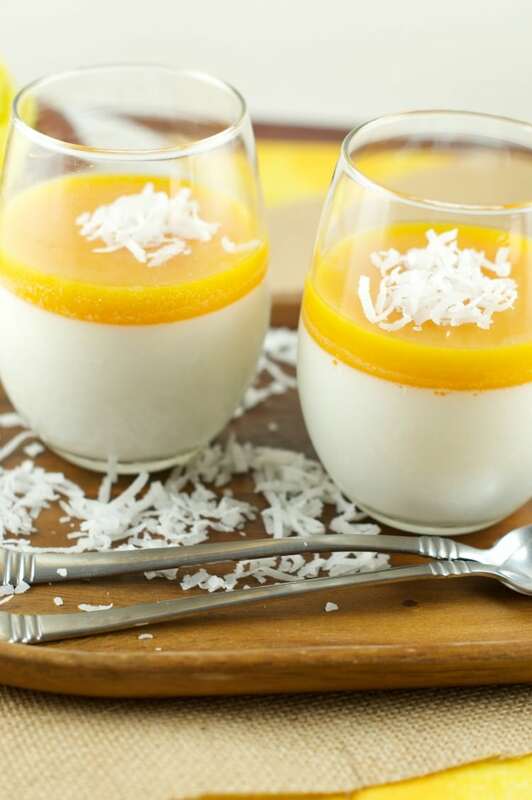 I am so happy I made this Coconut Panna Cotta With Mango Gelee. Not only is the taste spot on, but I needed a home run this week. Trying recipes and making new food has been a disaster these past few days. That’s the life of a food blogger, you have good recipe days and other days you want to quit. Developing recipes is sometimes like playing mad scientist. You need to calculate ratios, flavors, textures, etc. Luckily this one hits it out of the park and I am so proud on how they came out. In Venezuela, there were mango trees everywhere and people didn’t even do what to do with them. 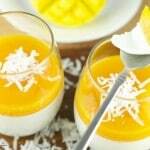 So you can imagine all the recipes we have for mangoes: jellies, compotes, mousses, cakes, gelees, ice creams, etc. I love the fact that mangoes are so flavorful and they remind me of home. 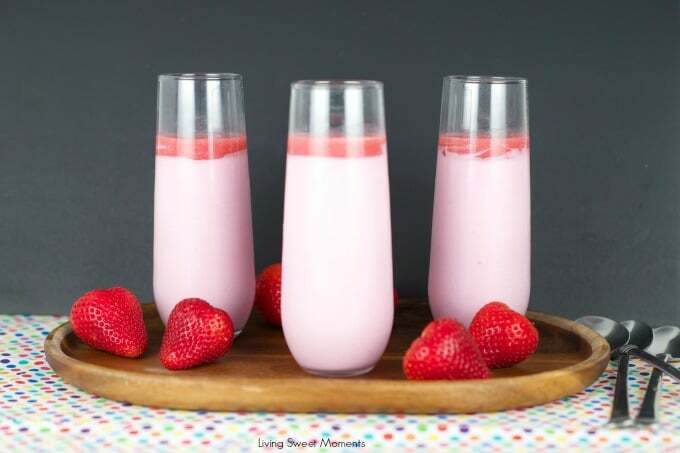 You can also serve them in little mason jars, champagne flutes or any other container you may like. Here’s what the little ones look like. Aren’t they cute? My daughters loved them! 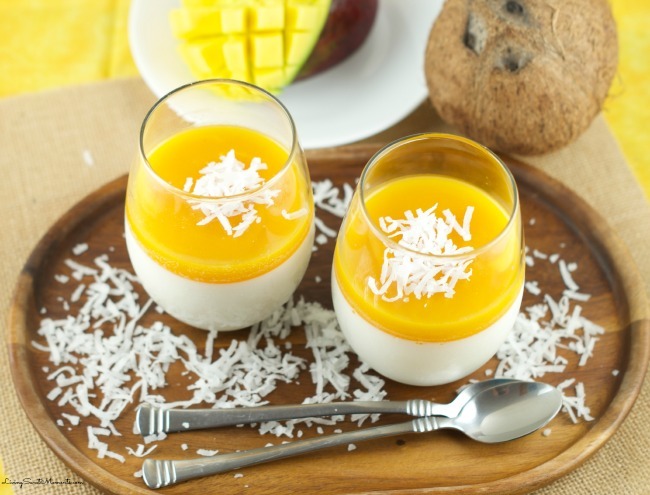 I hope you can try these delicious and beautiful Coconut Panna Cotta With Mango Gelee at home. If you do, please upload a pic on Instagram and tag me @Livingsweetmoments or use the hashtag #LivingSweet. I promise to repost it. Mango and coconut are two of my favorite. I look forward to giving this Panna Cotta a try! 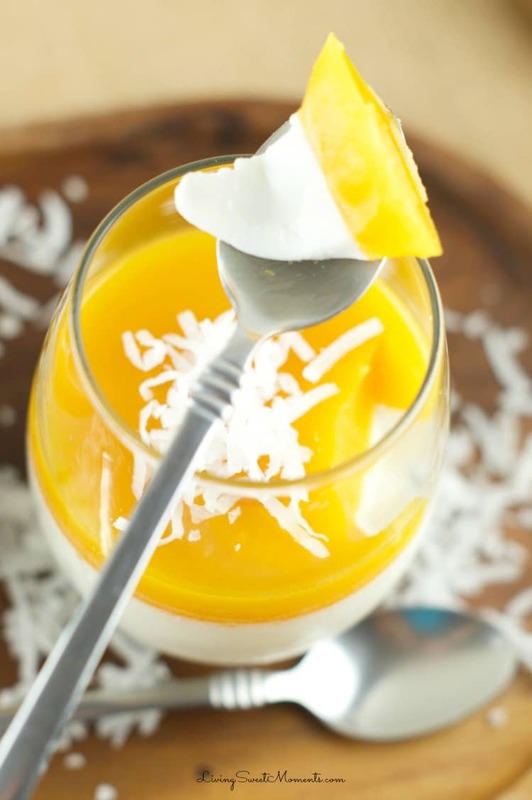 Mango and Coconut – this is a true winner for me! Love it! Flavers are nice but recipe asks for far too much gelatine. Doesn’t have the soft creamy texture it should. I have eaten panna cotta many times, but have never tried to make it before today. This recipe sounded amazing so I gave it a shot. The gelatine ratios are all wrong. I don’t often use gelatine in recipes so I didn’t know what I was doing, but since the recipe said to use 2 ozs, I used 2 ozs, which was 2 boxes of Knox gelatine, 8 packets in total . It seemed like waaaaaaaaaaay too much but again, since each packet was .25oz, and it said use 2oz, that’s what I did. I ended up having to trash it all, because it quickly set into rubbery lumps. Maybe it’s just my inexperience, but this recipe seems wrong. I made it again using 2 tsps instead of 2oz, and it came out perfect. Thanks for letting me know Samantha, I’ll adjust the recipe down. Wait Samantha, I just re-read the recipe. 2 oz = 2 envelopes not 8. 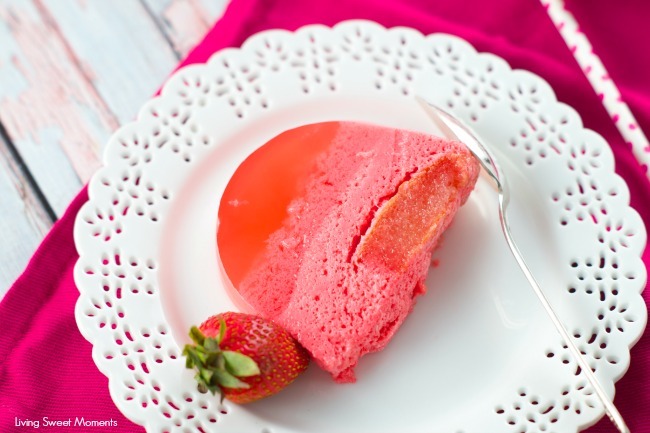 What brand of gelatine are you using? I love the flavour combination. And it looks beautiful! 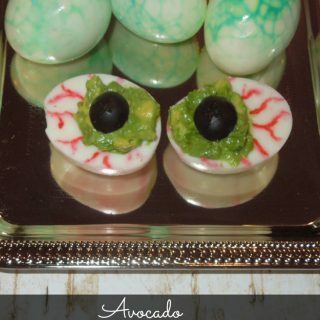 The first time I made this (using 2oz of gelatin) it was too hard and rubbery. But I replaced the 2 oz with 1 Australian Tablespoon. After this small alteration it was amazing. The coconut just melts in your mouth and the flavoure is great. It’s also not to sweet like alot or other recipes. Tiffany, Knox Gelatin is only .25oz per envelope, which I have found to be common with other brands. I think you are miss reading. Samantha is right, if you put 2 oz, thats two whole boxes = 8 envelopes. I am from the Netherlands where only gelatine sheets are used and not envelopes. I have tried converting envelopes to sheets before with other recipes and did not get fantastic results. Would you know the ‘sheet’ conversion? 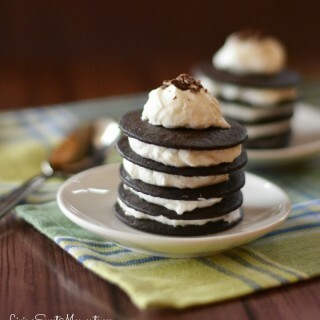 Hello, how do you think this would turn out with coconut cream in place of heavy cream? 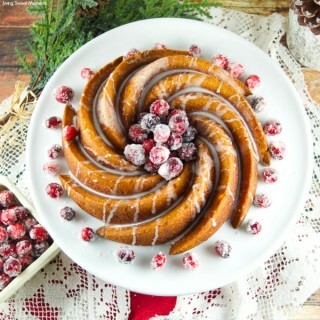 I made this for an event and it was really tasty but I would make a few adjustments. 2 oz of unflavored gelatin is not the same as 2 envelopes! One box of gelatin has 1 oz and each envelope is 0.25 oz. I used 2 envelopes for the panna cotta and it turned out very nicely. For the mango gelee I made it with one envelope of gelatin and it was very firm, almost the consistency of gummy bears when it cooled. I also wished there was more mango on each cup so I would double the mango puree and sugar next time but keep the amount of gelatin the same. Thanks for the recipe! I’m going to make it again! Thank you for the clarification Janelle! Glad you liked it! My husband and I totally loved this recipe. I used 2 gelatine leaves, therefore no added water and I threw in some vanilla. I popped some red berries on top & wrapped my tumblers in a couple of turns of glittery, gold thread for a Xmas touch. They looked so pretty and were a total hit. Can’t believe I omitted to take the photo. I will be organised next time . It was great to be able to have this made well ahead. Thanks! Hi Keryn! thanks for your feedback! 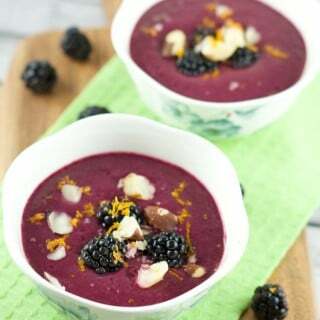 what a great idea on adding the red berries on top. Happy Holidays!